Dr. Harmik Hartounian, “Dr. Hart,” grew up in the Los Angeles area. He received his Bachelor of Science Degree in Biological Sciences specializing in Neuroscience from the University of California, Irvine. Dr. Hart moved to Florida where he received his Master’s Degree in Biomedical Sciences from Barry University. 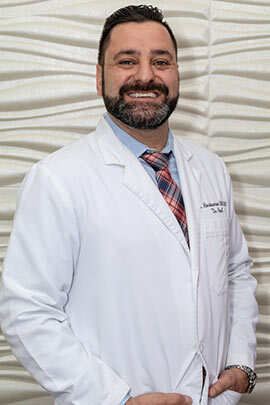 Pursuing his love and passion for dentistry, he remained in Florida and received his Doctorate of Dental Medicine from Nova Southeastern University, College of Dental Medicine in Ft Lauderdale. Dr. Hart practiced dentistry in Houston, Texas for a few years before coming back home to Los Angeles to be closer to loved ones. Dr. Hart has volunteered at the Ryan White HIV clinic in Florida providing free comprehensive dental care and education. Dr. Hart has completed advanced training in implants, fixed prosthodontics, and cosmetics. He is a member of the American Dental Association, California Dental Association, and the San Fernando Valley Dental Association. Dr. Hart values developing relationships and strives to give quality dental care and education to his patients. He believes an educated patient will have the best overall oral health. Dr. Hart loves to create a friendly environment in the office where everyone is equal and that the staff and patients are all viewed as extended family to him. His goal is to improve patient oral health and give patients a smile of which they can be proud.